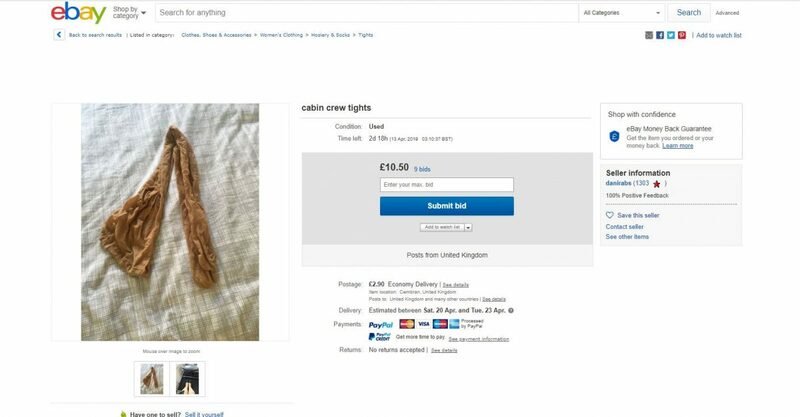 Cabin crew from top airlines are flogging used uniforms including shoes and tights on eBay, it has been claimed. Plane workers are flogging ”worn” outfits such as jackets and even name-badges – which appear to being bought by fetishists. Searches on eBay reveal a number of used tights and shoes often modelled on a plane with a picture of a pair of legs stretched out by the emergency exit door. One listing for a pair of used flight attendant tights says: “worn on many long distance journeys on very long hot shifts. ”Very worn and fragrant of my natural perfume as often worn minus underwear”. The clothing for sale bears the names of brands including easyJet, Airtours, Jet2, Virgin Atlantic and Emirates. Some of the items attract dozens of bids and, unusually for second-hand items, they come with a hefty price tag. One example is a pair of “very worn and tired cabin crew shoes” which have drawn 12 offers, the latest of which is £33 – and there are still three days of bidding.